New book, 48 pages, NVG140. First seen during the American Civil War and later appearing in the Franco-Prussian War and the Boer Wars, the military use of the armoured train only came to the fore during World War I, reigning supreme on the Eastern Front. Deployed widely during Russian Civil War the technology spilt over into the Chinese Civil War, and the subsequent war with Japan, the armoured train has played a major role in conflicts during the 20th century, being used during World War II and surviving to the present day -although more as a technological curiosity than a significant weapon. Steven J Zaloga examines the origins and technical development of armoured trains. 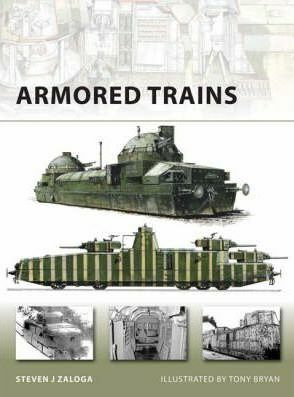 But rather than provide an encyclopaedic treatment of the many trains, it instead focuses on the more important and fascinating issue of how armoured trains were actually used in combat.